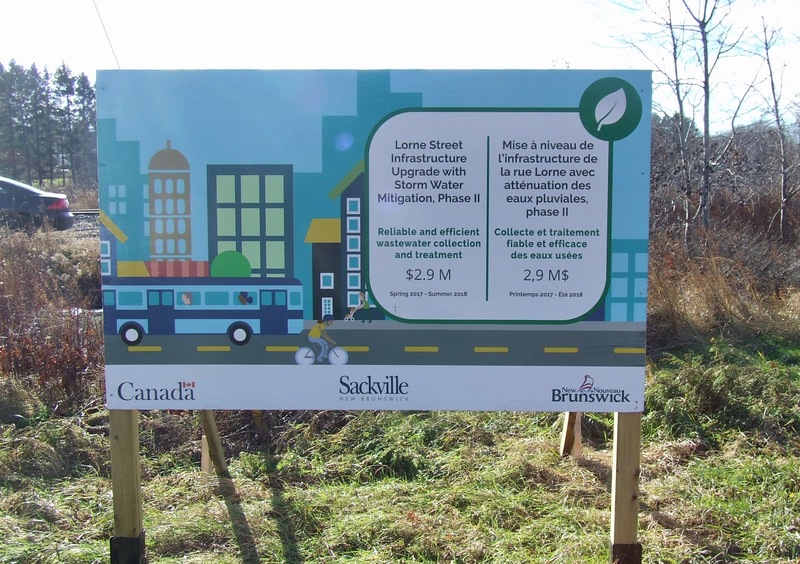 The Town of Sackville and Crandall Engineering of Moncton must answer a series of environmental questions before construction can begin on a massive flood-control project in a 33 acre (13.4 hectare) area between Lorne Street and the Tantramar River. The project is currently undergoing a formal environmental impact assessment that must be completed before the provincial environment minister approves it. As part of that review, a federal-provincial committee raised serious concerns late last month in a six-page letter signed by Christie Ward of the New Brunswick Department of the Environment. Among other things, the letter sharply criticized the town for not submitting information on species that may be at risk during construction, including ground-nesting birds such as the common nighthawk and bobolink. “Please be advised it is not possible to adequately evaluate the effects of the project on migratory birds, species at risk, and species of conservation concern, based on the limited information provided,” the letter said. It also chided the town for not outlining steps to avoid or minimize harm to such species. In its formal response on behalf of the town, Crandall Engineering promised to gather information on species at risk and to come up with a plan to mitigate any damage, but it did not promise further surveys by professional biologists, since it said construction won’t be happening during bird-nesting season. That response will now be assessed by the federal-provincial, technical review committee to determine if it meets the necessary requirements. The committee is also calling on the town and Crandall to fulfill a number of other requirements, including detailed mapping of all wetlands in the area, taking steps to minimize greenhouse gas emissions, and preventing the release of hazardous materials during construction. To read the technical review committee’s letter, click here. To read Crandall’s responses on behalf of the town, click here. 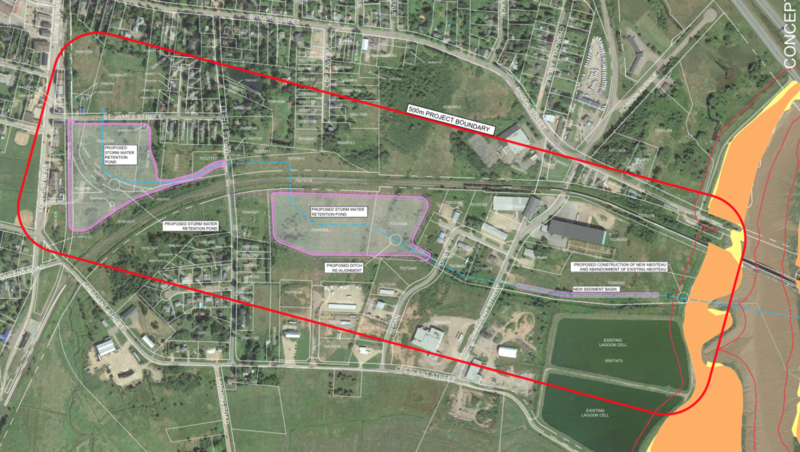 Drawing showing the scope of flood-control project with two large retention ponds outlined in purple: the first, south of St. James St. and the second, south of the CN rail line, east of Charles St.
As part of the environmental impact assessment, the town was required to hold a meeting last week to gather comments and questions from the public. A drawing showed the two large retention ponds that will be designed to store flood water during major storms until it can be discharged to the Tantramar River at low tide. The project includes about 1.8 kilometres of channels to carry the stormwater such as major new ditches, concrete culverts under road and rail crossings, as well as a new aboiteau near the river that can carry four times more water than the present wooden one. Town Engineer Dwayne Acton explained that the $2.9 million project no longer includes a wetland pond just east of Lorne Street and north of St. James. The town hopes that Ducks Unlimited will construct and pay for that smaller pond sometime next year as an extension of the Sackville Waterfowl Park. Sackville environmental consultant Sabine Dietz asked for an example of a similar scheme using large retention ponds to store stormwater on a low-lying flood plain rather than further up in the drainage basin. Crandall engineer Nathan LeBlanc said he didn’t have an immediate answer, but would get back with more information. Later, Dwayne Acton said the town is well aware of the need to construct retention ponds closer to areas like the old quarry, where flood waters originate. To read more information about the flood-control project that the town filed as part of the environmental impact assessment, click here. Note: Anyone who wishes to submit a comment or question on the flood-control project to the Town Engineer can do so by e-mailing d.acton@sackville.com before 3 p.m. on December 5th. This entry was posted in Environment, Town of Sackville and tagged Christie Ward, Dwayne Acton, flood control, Lorne Street Phase Two, Nathan LeBlanc, Sabine Dietz. Bookmark the permalink. Maybe if they had ‘seriously’ looked at the alternative (and ‘preferred’, as well as considerably cheaper) route then construction would be well underway by now. The proposed path out by the Landing Road/Armtec area was dismissed by Crandall Engineering for two reasons. One was because of what Crandall repeatedly called a ‘mountain’ to go through. This mound of earth was certainly not a barrier to those in the know ($10,000 estimated excavation cost) and as well one could have very easily bypassed it less than 200 metres east. The second item concerned the location of the new aboiteau which would be installed near the end of the old dump on the Ram Pasture section of the Tantramar River. Crandall said they felt that this area would silt fill in time. No consideration was given to simply turning the end of the proposed drainage ditch towards the main body of the Tantramar (downstream about 500 metres from the current Crandall Proposal) and simply installing a new aboiteau there where the river is very near the dyke and would not affect any salt water wetlands. It appears that all the land that this rejected proposal involves is currently zoned Agricultural Land (and mostly inactive at present) and it presumably would be MUCH easier to attain permission to resculpt than the Wetlands area around St James Street/Charles Street and it would be much less intrusive in this non residential, marshland area. This rejected proposal had the tentative approval of all 5 landowners. On this marshland, all the excavated material, including that removed for any necessary holding ponds, could remain adjacent the excavations and simply be levelled off. The current proposal does NOT address the flooding threat to the Armtec Building or to all the marshlands in the area west of Crescent Street. If only the Consultants would consult! Percy if they get much closer to your land they may be able to use your new ditch.